This study used the Maslach Burnout Inventory to evaluate the degree of burnout among junior doctors at Red Cross War Memorial Children's Hospital (RXH), Cape Town, and the influence thereof on the retention of valuable skills in the hospital. It further considered measures that could be taken to mitigate the causes of burnout, by means of qualitative methods. BACKGROUND: The research explores the significance of burnout and the role it plays in the retention of junior doctors at RXH. There has been an increase in the migration of medical doctors worldwide, with an exodus of doctors from South Africa. Along with the effects of HIV/AIDS, this places extra strain on those who remain. METHODOLOGY: A two-part, mixed quantitative and qualitative study consisting of a validated measure, the Maslach Burnout Inventory, was sent to 39 junior doctors at RXH. Responses were received from 23 doctors (one of which was invalid), constituting a 60% response rate. The second part consisted of four semi-structured interviews. RESULTS: Of the 22 respondents, 100% experienced a high degree of burnout on one of the three scales of burnout, namely emotional exhaustion, depersonalisation and reduced accomplishment. 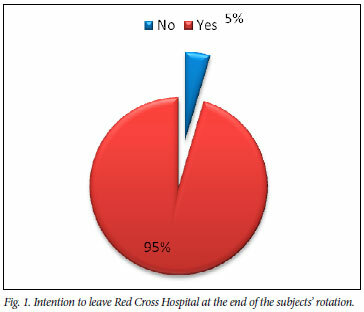 Of those surveyed, 95% expressed an intention to leave RXH. CONCLUSION: The degree of emotional exhaustion and depersonalisation experienced by the junior doctors at RXH was significantly higher than that in a normative sample of 1 104 doctors. Recruitment, improved management and planning, increased support, mentorship and a more empathetic administration were some of the factors suggested to mitigate the burnout experienced by the junior doctors. Junior doctors in South Africa work long hours. Many hospitals require them to work 30-hour shifts and little provision is made for illness, with colleagues having to cover for each other if a fellow junior doctor is sick. AIDS has resulted in increasing numbers of patient deaths, and a higher burden of disease. This has added to the workload, and in many cases also to the complexity of decisions. All the above factors have increased the burnout rate among junior doctors. At the same time there has been a significant exodus of doctors from South Africa.1 These doctors tend to be young (under 42 years), male and not yet specialised. This exodus vastly increases the workload of the doctors who remain. Unless sufficient emphasis is placed on the effects of burnout and other causes of medical migration, and attempts are made to mitigate them, South Africa will continue to lose doctors to the global labour market, ultimately resulting in detrimental standards of medical care. 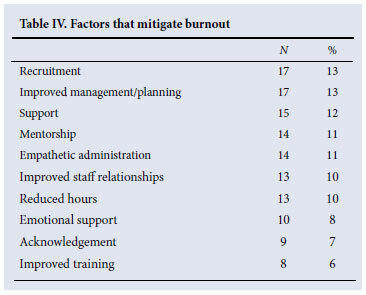 The purpose of the research was to measure burnout in junior doctors at Red Cross War Memorial Children's Hospital (RXH), Cape Town, through the administration of a standardised measure known as the Maslach Burnout Inventory (MBI), and then statistically compare their burnout with that in a normalised sample of doctors supplied by Maslach et al. in their research guide.2 A sample of the doctors at RXH was then interviewed to qualitatively assess what can be done to mitigate the burnout. The research was conducted in two sections. The first section was quantitative in nature. The MBI was used to measure the level of burnout experienced by the junior doctors. The burnout scores were compared statistically to normative data of a sample (N=1 104) of doctors. The second section of the research was qualitative in nature and consisted of four interviews. The interviewees comprised one senior house officer (SHO), one junior registrar and two senior registrars. The interviews were recorded and transcribed, and subsequently coded and analysed in order to provide suggestions of what can be done to mitigate burnout at RXH. The completion of an electronic questionnaire was performed on a voluntary and private basis, thereby minimising response bias. In addition, it was conducted through a third party, which ensured respondent confidentiality. Furthermore, the questionnaire was presented as a survey on skills retention and did not make any mention of burnout. This ensured that the respondents were not sensitised to the concept of burnout and did not tailor their responses in this regard. Only questionnaires that were completed in full were analysed. Partial answers were discarded to protect the validity of any correlations or assumptions made. The second section of the research involved four interviews, which followed a semi-structured standardised format and were completed in person. The sample for section 1 of the research was derived from the population of junior doctors at RXH in November 2009. The relevant population for the time period concerned consisted of 24 registrars and 15 SHOs (a total of 39 junior doctors). An e-mail with a link to an electronic survey was sent to all the SHOs and registrars. The questionnaires were sent out repeatedly via e-mail until 60% of the population had responded. This response rate represents a 90% confidence interval with a 10% margin of error. The mean age of the respondents was 30 years (standard deviation (SD) 3.26 years), with a 3:1 female preponderance. There was a mean postgraduate experience of 5 years and 9 months (SD 2 years 9 months), and mean hours worked per week 62.4 (SD 12) hours. This suggests that the average junior doctor at RXH was a 30-year-old woman, with almost 6 years' postgraduate experience, who worked approximately 62 hours a week. If RXH aims to attract and retain staff, allowances must be made for the fact that female employees might want to have a family. In a scarce-skills environment such as this, an organisation with progressive maternity and childcare policies is more likely to attract and retain the skills it requires. Virtually all the respondents indicated an intention to leave at the end of their rotation (Fig. 1). This corresponds with the high levels of emotional exhaustion illustrated by the survey (Table I). Table I shows that there is a strong correlation between high levels of emotional exhaustion and intention to leave, while Fig. 1 strikingly illustrates that a significant problem exists regarding the retention of valuable skills. All 22 respondents experienced burnout on one of the three subscales of burnout. Fig. 2 illustrates the percentage of junior doctors surveyed who experienced high, moderate or low degrees of burnout on each of the burnout subscales. Each subscale was statistically compared with a normative sample of 1 104 doctors. The score for emotional exhaustion can be categorised as follows: low - <18; moderate - 19 -26; high - >27. These scores represent the lower, middle and upper thirds of a normative sample of 1 104 doctors, with a mean of 22.19 (SD 9.53). 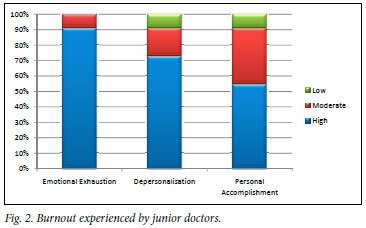 The mean score for emotional exhaustion in the sample of junior doctors at RXH was 37.68 (SD 8.90). Levels of emotional exhaustion among the junior doctors at RXH are significantly higher (p=3.29×10-13) than one would expect from a population of doctors when compared with the normative sample (N=1 104). This score can be categorised as follows: low - <5; moderate - 6 - 9; high - >10. The mean from the normative sample previously described is 7.12 (SD 5.22), while the mean score for this subscale of burnout for the RXH doctors was 12.63 (SD 5.60). There are significantly (p=2.35×10-7) higher levels of depersonalisation at RXH than one would expect in a population of doctors when compared with the normative sample (N=1 104). This is of particular concern as it implies that three-quarters of the junior doctors are detached and callous to their patients, which has implications for the quality of patient care. This score can be categorised as follows: low - >40; moderate - 39 34; high - <33. The mean from the normative sample previously described is 36.53 (SD 7.71). The mean score for the RXH doctors for this subscale of burnout was 32.14 (SD 5.83). It can be concluded that the junior doctors at RXH experience an average (p=0.998) degree of personal accomplishment when compared with an average population of doctors. 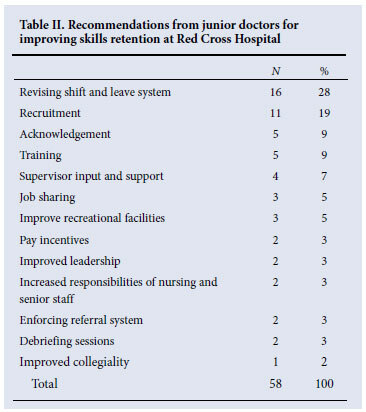 Among the responses to the survey from the junior doctors, the most common recommendation for improvement for skills retention was revising the shift and leave system. This suggestion was strongly linked to the recruitment of additional staff (Table II). The category 'poor planning' relates to administration foresight and the management of potential problems. These include both human resources management, such as pending maternity leave of colleagues, and operations management planning with regard to a potential influx of patients (as is typically the case during the annual gastro-enteritis season). Emotional stress also added to the experience of burnout among junior doctors. This can be mitigated through mentorship, peer support groups, debriefing sessions and comprehensive new employee orientation programmes. Analysis of the interviews suggests that a great deal of burnout experienced by the junior doctors could be mitigated through increased recruitment and improved management and planning by the administration. Increased support from senior colleagues, formal mentorship and an empathetic administration also featured highly as mitigating factors. Formal mentorship and 360º feedback sessions at the end of each junior doctor's block would motivate, encourage and support them. What can be done to mitigate burnout? Other strategies identified in the literature include staff retreats, 4-day work weeks and an increase in staff size.5 These strategies are, however, less applicable to the resource-scarce South African environment. 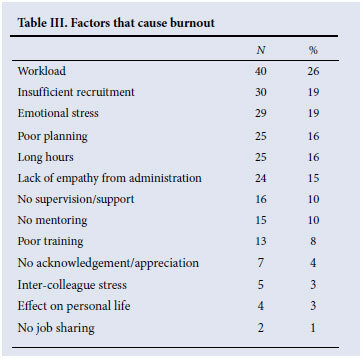 A statistically significant amount of burnout is experienced at RXH. This has a negative effect on the retention of skills and the quality of care at the hospital. For this reason steps must be taken to mitigate the burnout experienced by junior doctors. These steps can be divided into financially-based and nonfinancially-based factors.  Exit interviews with junior doctors to ascertain why they are leaving.